The open chapel at Teposcolula, built in the second half of the sixteenth century, is the outcome of a unique combination between monumentality and experimentation. This Mixtec open chapel was built as a response to the transformation of religious cult. The building is configured as a single nave that opens its long side facing the west towards the atrium, where the numerous indigenous people attending the ceremony gathered. Following a symmetrical scheme, the chapel houses a ribbed vault with a hexagonal base covering the area designated for the altar. The spaces on each side of the dome (north and south) are covered with a roof system of wooden beams. A peculiar feature of this building is that much of the supporting elements are columns, creating a very open floor plan. The back wall and sidewalls reinforce the structure while forming a rectangle that serves as a backdrop for the activities developed in the chapel. The experimental nature of open chapels in Mexico was due to a lack of regulation that allowed the development of distinctive buildings.The scheme of the building was resolved with technical audacity and refined craftsmanship. Its hexagonal vault was conceived at the edge of the sixteenth-century vanguard and has no known precedent in the repertory of Hispanic architecture. 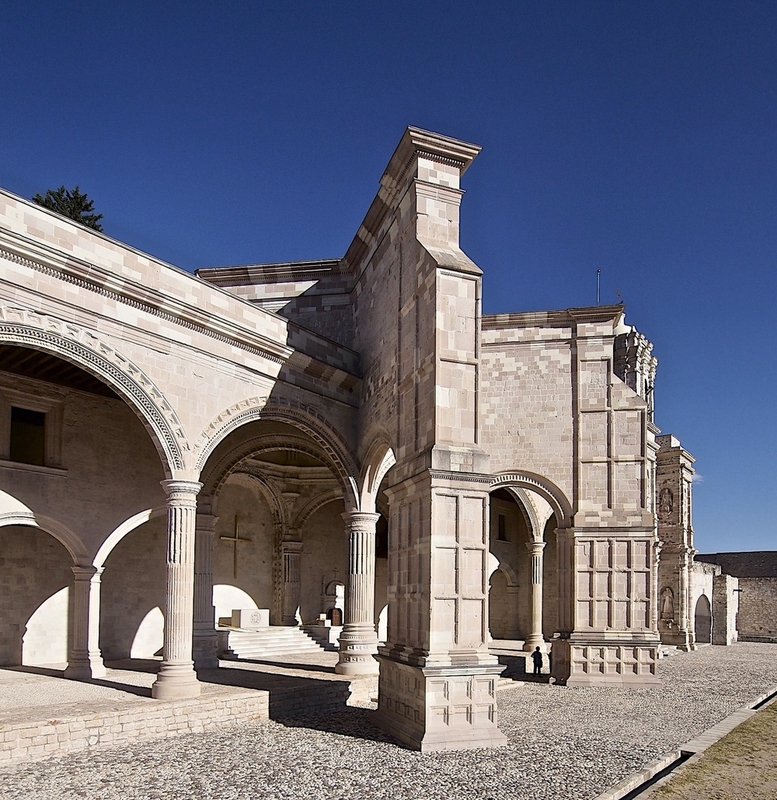 The open chapel of Teposcolula is an outstanding example of the cultural syncretism that took place during the sixteenth century in the Mixteca region. The building in San Pedro y San Pablo Teposcolula contains only one vault with a hexagonal plan. By looking at the horizontal projection (plan) of this vault one can notice that the tiercerons are drawn by equilateral triangles coinciding with the vertices of the hexagon. 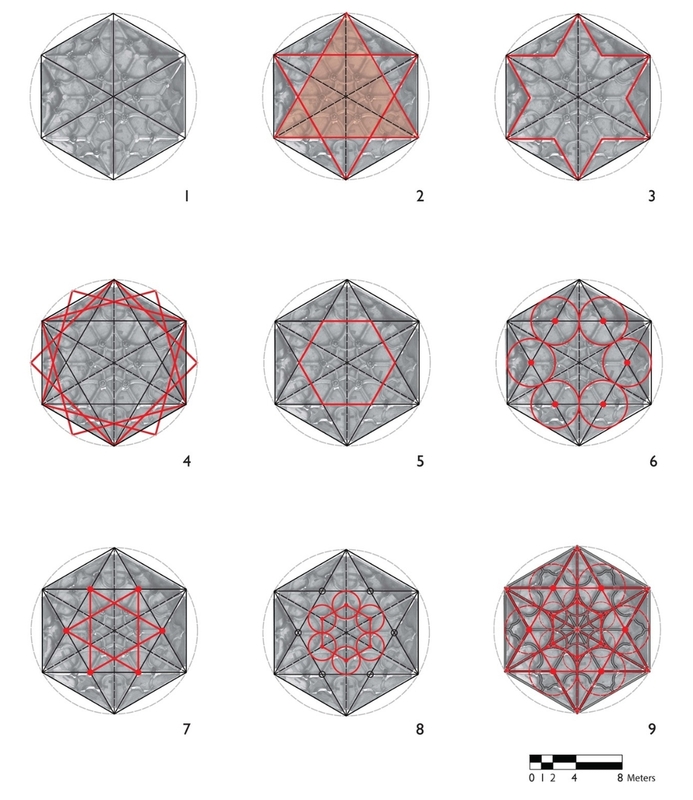 An intriguing characteristic of this design is that this operation of triangles within hexagons can be repeated multiple times, as many as the drawing and pencil allow. Following this procedure, one can notice that the layout of subsequent ribs respond to these smaller triangles. A noteworthy feature of this vault, which is not shared with vaults seen previously, is the presence of warped ribs. This study has found that the warped ribs drawn in the horizontal projection are two: a set that links the diagonal ribs crossing the ridge rib and, closer to the zenith, a set of ribs linking the ridge ribs with the diagonals. For the first set of ribs, it is necessary to draw a circle tangent to the diagonals making a center on the tiercerons’ intersection. For the latter, the circumference is defined by the smaller hexagon obtained by drawing two triangles whose vertices coincide with the point where the tiercerons intersect. The vertices of this smaller hexagon are used as centers of the circles. The drawings on this image show vertical sections through each one of the Teposcolula vault’s arches. Looking at the vault on the vertical projection one can find that the diagonal and ridge arches are semicircular, defining a dome of spherical geometry. 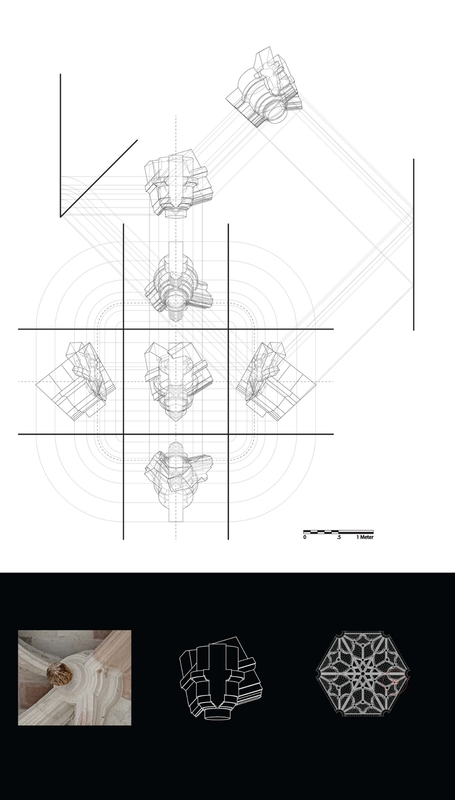 Therefore, tiercerons respond to this geometry and are obtained by slicing the dome vertically. This spherical shape is a result of both the construction process and the desired geometry. The other set of warped ribs, both emerging from the tierceron boss, are delineated on neither the vertical projection nor the horizontal projection. In order to define these tilted planes one should find three points in the arches’ intrados, which are the points where these warped ribs intersect with other arches. Finding these tilted planes permits one to draw circular segments that otherwise would be elliptical in the orthogonal projections. The purpose of this more elaborate process is to allow the stone carving to be more accessible as masons dealt with circles instead of ellipses. Teposcolula’s vault is similar to those vaults built in the Spanish region of Andalusia. This vault was conceived as a six-sided sail vault with a lush weaving of rectilinear and warped ribs that make it very similar to the vault of the chapel of the Santo Cristo de las Batallas in the Cathedral of Salamanca. Both vaults are contemporary and are spherical; their difference is in the number of sides of the polygon supporting them. Because of the hexagonal shape of Teposcolula’s vault one can affirm that it is one of its kind in the Americas. The molding section of the warped ribs is distorted. This distortion is known in Spanish as molde revirado, which responds to the relationship between the location of the ribs and the spherical surface. By twisting the ribs section the ribs acquired verticality within the dome. The solution for bosses in Teposcolula’s vault varies: the bosses at the intersection of the warped ribs with tiercerons are pointing toward the center of the tiercerons’ arc. The axis on the rest of the bosses is vertical. The bosses on the intersections between the warped ribs and the diagonals are so close to the zenith that there would not be much difference between one vertical and one pointing to the center of the diagonal arc. Teposcolula’s voussoirs coursing is known in Spanish as "a la vuelta de horno", which consists of slicing the dome horizontally in order to form concentric lines.